Casa Aura B&B started business early in 2009 and is family operated. Ours is a warm and friendly place that will allow you to explore all the fascinating sites nearby and will give you the opportunity to know first hand the cultural and historical legacy of what was the 1st capital city of Costa Rica. All our rooms have their bathroom (with hot water), handy closets, and free access to our wi–fi network. The beds' linen is of the best quality and hypoallergenic. All our rooms are cleaned daily! 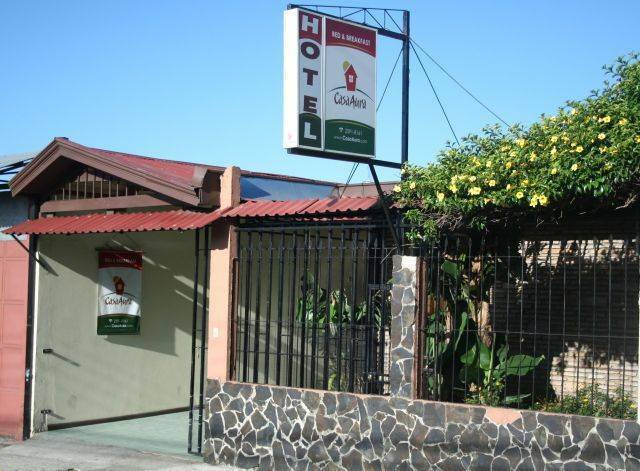 Conveniently located: right in the heart of the city, 3 blocks north from Cartago's Central Park. We are close to all bus hubs, the local market, the main restaurants and fast food chains, as well as health care centers. At Casa Aura we strive to make your stay as pleasant and relaxing as possible! All our rooms have very recent furniture (2009) and the beds' linen is of the best quality and hypoallergenic. All our rooms are cleaned daily! Breakfast is served until 9:30 am and as early as you require it! Our prices include all taxes and stay the same all year round: there is no high or low season at CasaAura! We take cash and all major credit cards. We also have special prices for long stays. All our rooms have very recent furniture (2009) and the beds' linen is of the best quality and hypoallergenic. All our rooms are cleaned daily! All rooms have their bathroom (with hot water), convenient closets, and access to our wi–fi wireless internet network. We provide the best accommodation for the budget conscious traveler, and breakfast is included of course. Breakfast is served until 9:30 am and as early as you require it! Our prices include all taxes and stay the same all year round: there is no high or low season at CasaAura! We take cash and all major credit cards. We also have special prices for long stays. * Any reservation request made through our “Booking & Rates” section is only a preventive, not a formal reservation. A reservation request will not be considered final until Casa Aura B&B issues a reservation confirmation via e-mail or fax to the requesting party. * Casa Aura B&B may cancel any reservations up to 15 calendar days prior to the arrival of the party or parties. In such case Casa Aura B&B will duly notify the party through an e-mail or fax. Any partial or total payments previously made will be reimbursed. * Any changes required on a confirmed reservation must be reported to Casa Aura B&B as soon as possible; an extra charge may apply. If there is no room availability for the new dates, this will be considered as a cancellation by the party. Any partial or total payments previously made will NOT be reimbursed. * Reservations are only transferable with the express authorization of the holder. Upon approval, an administrative charge may apply which will be informed to the new party in due time. Casa Aura B&B nevertheless reserves the right, at its sole discretion, to reject the transfer.